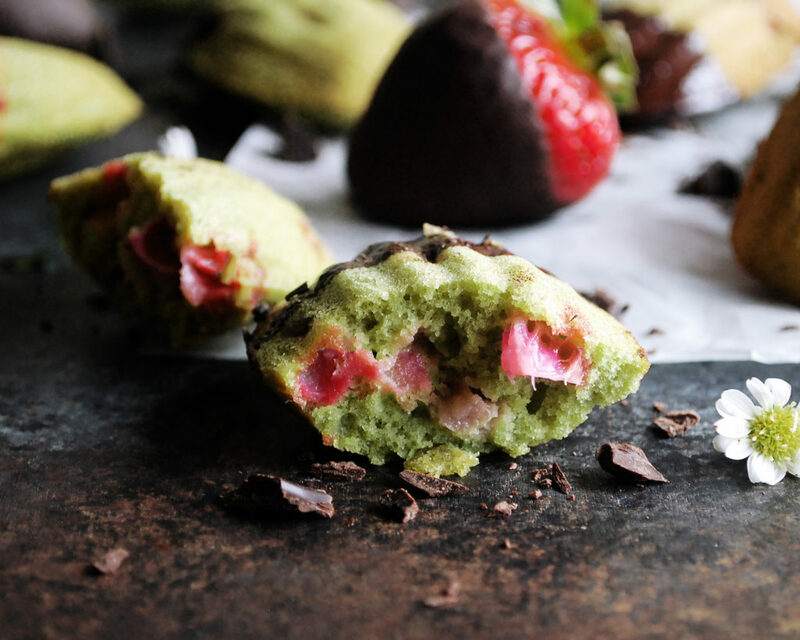 Matcha, dark chocolate, and strawberries…a perfect combination. 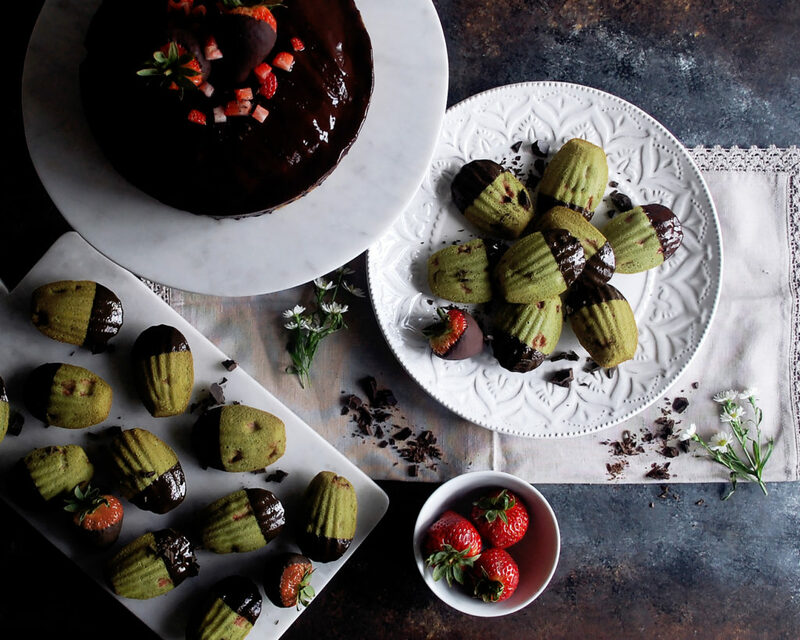 I’ve been wanting to bake with matcha for awhile now, and when I got around to it this combination was the result. 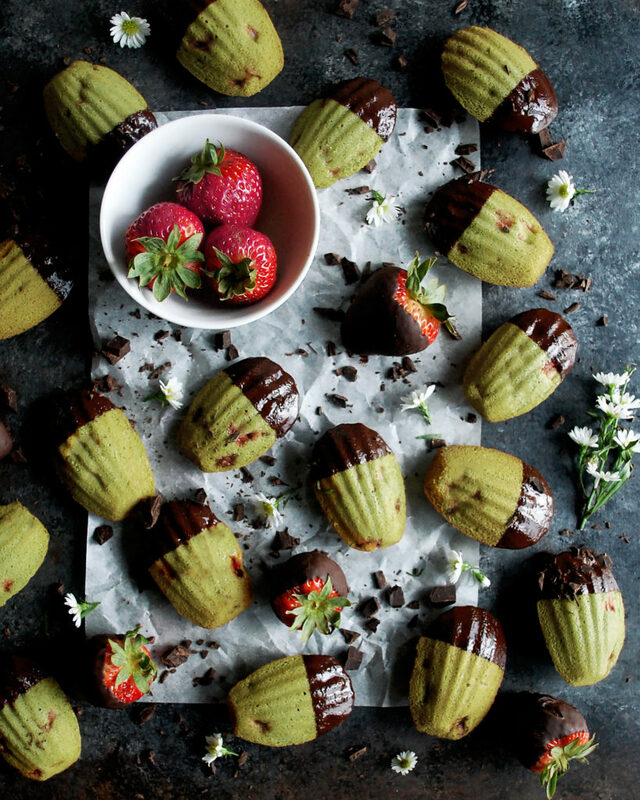 Light and airy matcha madeleines studded with sweet, fresh strawberries and dipped into intensely dark chocolate. Not a bad little bite if you ask me. If you don’t know what a madeleine is, it’s basically a small cake with a very distinct shape, one that you might think of it as a cookie. To make them, you actually need a special pan to spoon the batter into…like this pan from Williams Sonoma. Once baked, the batter sets and puffs, creating an individual shell-like, ridged cake. They are absolutely wonderful. I’ve always liked madeleines. Even though it’s fun to play around with different flavors like these, I think the plain vanilla ones are still my favorite. They are so delicate, yet rich and buttery. And they’re not overwhelmingly sweet, which makes them the perfect treat to dip into coffee or tea. I’ve really gotten into drinking matcha lately. I’ll use a ceremonial grade matcha for drinking. But they also sell culinary grade matcha which is perfect for baking. I whisk just a few teaspoons into the dry ingredients. 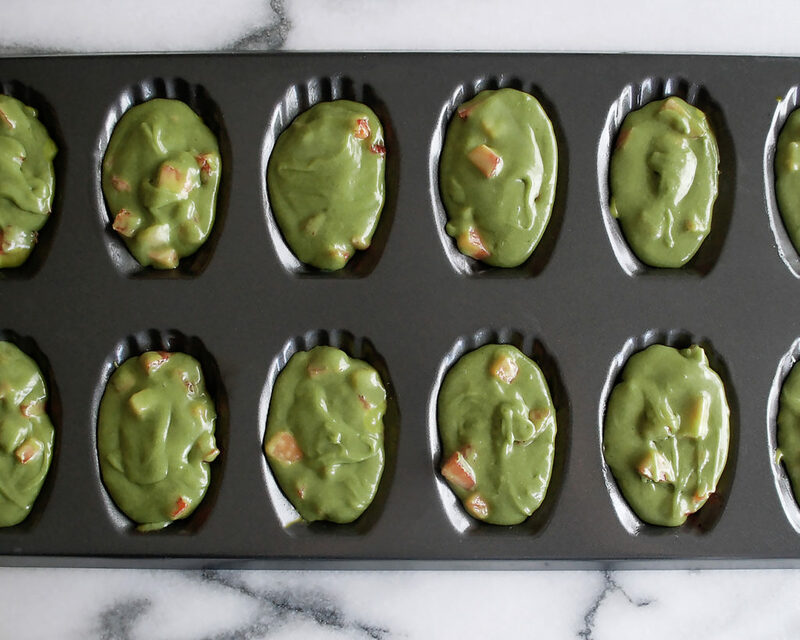 It turns the batter light green, and affects the taste ever so slightly. Strawberries are in season, so I bought a ton, snacked on them all day, and then chopped a few up for the batter. The strawberries add little bursts of fruity sweetness. They also inspired me to add chocolate to this recipe. 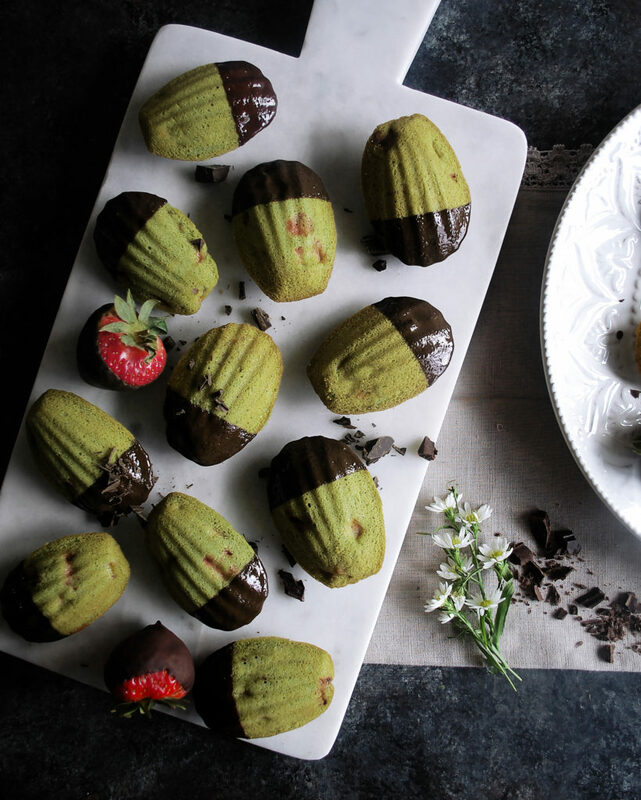 Just a simple dip into some melted dark chocolate gives the madeleines a finishing touch. If you’ve got extra strawberries, you can also dip those too. 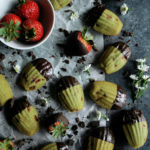 Let both the madeleines and the strawberries dry out on a rack so that the chocolate can firm up. You can even pop them in the refrigerator for a bit. But, make sure to let the madeleines temper so they are served at room temperature. I didn’t like them chilled. Also, it’s best to eat these right away. After a day or two they lose their freshness. Enjoy! Preheat the oven to 400°F. Coat a madeleine pan with butter and sprinkle with flour (shake off the excess). In a mixing bowl, whisk the flour, salt, and baking powder until incorporated. Sift the matcha into the bowl. Whisk to combine. In a separate mixing bowl, whisk the eggs, sugar, and vanilla. Incorporate the dry ingredients into the wet ingredients. Whisk in the melted butter. Fold in the strawberries. When the mixture is combined, spoon about a tablespoon or two of batter into each mold, just enough so that it almost reaches the top. Bake for 8-10 minutes until the cakes are slightly golden. Remove the madeleines from the pan and let cool. When the madeleines are cool, melt the chocolate in a small bowl. Dip each madeleine into the chocolate half way, spooning the chocolate up the sides if needed. Place them on a wire rack that’s been set over a piece of parchment paper. Let the chocolate solidify. I like to dip some strawberries, as well, using the same process as the madeleines. 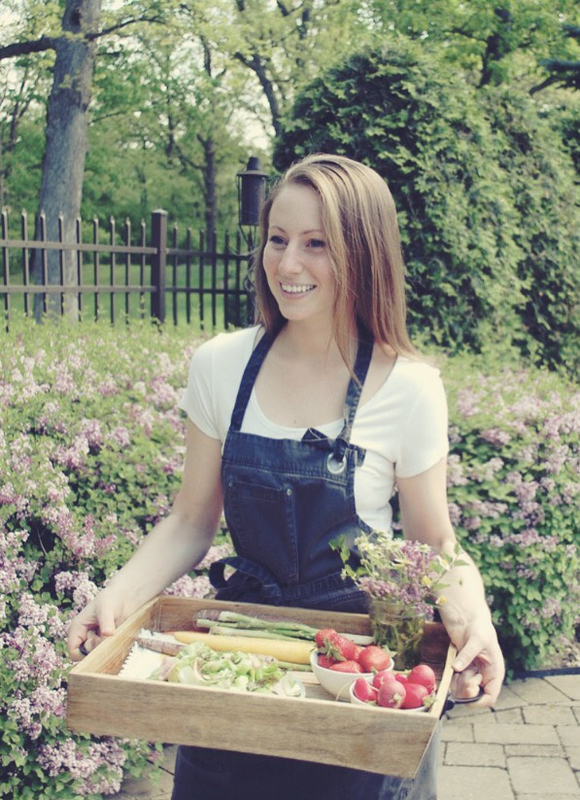 Keep these yummy recipes coming; truly delicious . I can never get enough madeleines, which is why I avoid buying these. I eat non stop! 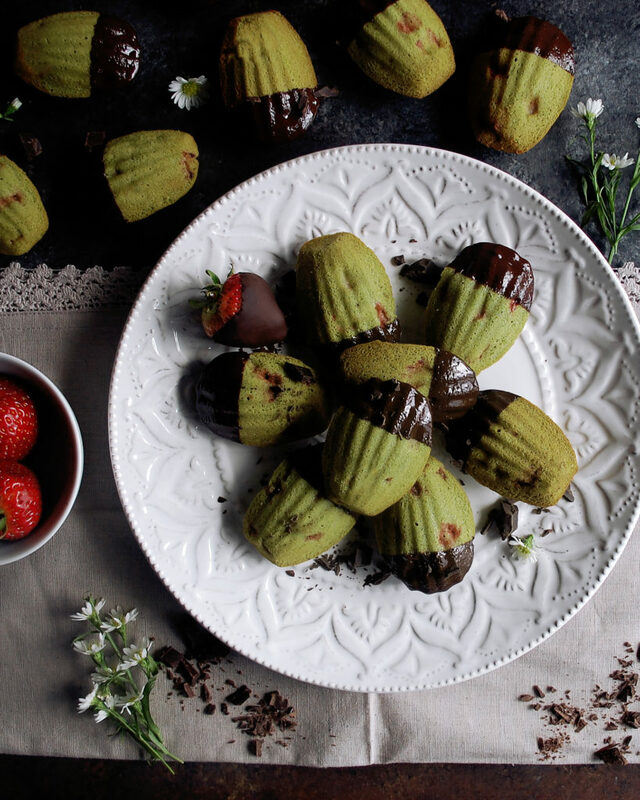 with matha and chocolate dip, these look absolutely irresistible. I am the same way!! The vanilla ones from the store are honestly so good. This combination worked really well! What an interesting flavor combination! 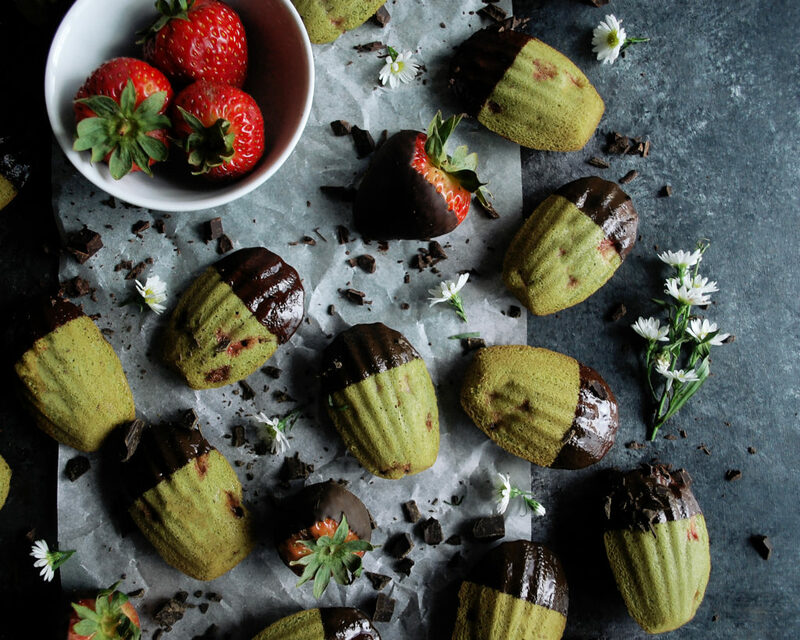 I’ve never thought to put matcha and strawberry together but now that I seem them in these Madeleines they look so perfect together. Yes!! I was a little hesitant at first, but everything went together perfectly!